In our well-equipped assembly area we are able to produce a large variety of magnetic assemblies, from very small to very large. We combine our magnetic knowledge with assembly experience and creativity. We also invest in research for coating and gluing techniques with the final aim to serve our customers a unique solution for their application. It is inevitable that permanent magnets will become a key component for many new technological developments in the coming decades. We are involved in a large variety of these developments. As well for the magnetic design as the final production of the magnetic assemblies. The field of application varies from smaller high-tech solutions to larger assemblies for drive & motion applications. We combine magnetic knowledge with assembly experience and creativity. Beside this knowledge and experience, we continuously invest in research for coating and gluing techniques with the final aim to serve our customers a unique solution for their application. 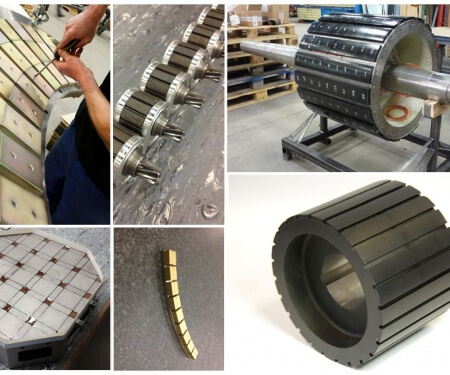 For more information you can call our specialist: +31 (0)40 2678 820 or send an e-mail to mta@bakkermagnetics.com.